My fellow humans, my name is John and I am the mayor of New Mycroft, a city in the country of Cities Skylines and I want to talk to you about politics for just a minute. Well, no more. Based on my track record as a mayor of a city in a Cities Skylines, I now announce myself as candidate for any political office in any country that will have me! Here are the policies that made me a successful mayor, and why you should support my campaign. Yes, even the cronies get taxed! You think you get nice districts because I am nice? No, you are rich, you can afford the same high tax rate as everyone else. And it will be funneled into Schools and Hospitals and services. Be rich all you want, but you are going to get into the community spirit, or else. Tax relief is given to the poor. Come, on people. If a person has £100 a month to live on and they pay £10 on tax, doubling it to £20 has a significant impact on their ability to survive and isn’t even going to pay for one expense account funded fact finding mission to Disney World. It isn’t rocket science. In areas where the income is lower, my high tax policies will be waived. So you can find a place to live, and survive and go to school, and get a job and become a rich crony of the future. Then you can pay like everyone else. I play the long game, and I play to win! I suppose technically high density residential isn’t necessarily a poor area, but it is the likeliest place for poorer folks to go, so lower taxes. Free accommodation for anyone who disagrees with my tax policies or breaks the law in my well funded Jail! Inmates are well cared for and guarded by 100% professionals, and definitely not Developing World Mercenaries that the Hague are looking for. We try to help rehabilitate them (the inmates. The guards are lost to us…) with courses and even an inhouse library. There were a lot of requests for Dumas. I wonder if that is significant? New Mycroft is based on a square grid system that allows commercial and office zones to flourish with skyscrapers to live in round the outside, and industry far away but with subterranean access to your shops. Just like moles. Because you won’t be able to drive to work or shops. You will need to use the overpriced, but frequent public transport to get to your destination. Or one of the frequent Sky Bridges. I love Sky Bridges. You will be able to get anywhere you need by public transport. And the aforementioned inflated ticket prices will pay for things like schools and hospitals and police & fire stations, and they will take you at least part of the way to places you want to go. Sort of like Budget Airlines of my acquaintance. Plus, eco friendly and all that. For folks who can’t afford posh, there shall be suburbs next to highrises and motorways. Green Belt throughout the city! To silence eco-moaners, we have sandwiched parks, graveyards and trees in every space we could cram them between the motorways and the high rises. They also make living in the little communities next to motorways the most idyllic motorway settings you will ever find…plus, Sky Bridge…and Monorail. Guarantee of Refuse and Deathcare arriving within 2 to 3 weeks of the point of need. Nobody likes their bins overflowing, or the corpse of Great Aunt Sally decomposing in the living room for more than a week or two. That is why I will fund adequate support vehicles and make sure traffic jams are hardly ever responsible for late refuse or corpse collection. And in the event vehicles are delayed, please stop throwing them into the street! You’re attracting rats, and the hospital just got the last cholera outbreak under control. We encourage foreigners to visit our city! That’s called tourism! As Mayor of New Mycroft, when people say that there are loads of foreigners coming over her, I say great! They can buy stuff in our shops keeping folks in jobs! Tell the fast food shops to salt their fries and water their drinks, there is money to be made…wooo! We wont have any of that racism nonsense, not in my city! Anyone causes any trouble for our guests, well, you saw the jail, right? come by plane, or train. We couldn’t get a camera lens wide enough to get the boats in frame. Entire districts given over to your entertainment! After a hard day in the mine, mill, mall or office we all need to kick up our heels. Entertainment districts were built so that you could go to the movies, night clubs and other miscellaneous entertainment venues. All within easy walking distance of a path or monorail. We invest in noise reducing office blocks. Many residents were unhappy living too close to noisy entertainment districts. So we built some office skyscrapers as the only folk in them at night when the noise is loudest are the the execs having secret affairs with their secretaries. I don’t care about the dignity of those faithless individuals. In fact I find it rather amusing to think of them sneaking around all the while a Toto Reunion concert is going on right outside their window. So, my fellow humans. Cronies and High Taxes, to pay for the things you need to live well. A vote for me, is a vote for you. And Khonshu bless you all. Ok, if it was unclear that was a bit of satire I decided to cook up as something different. It does have some of my actual opinions in it, which I was going to avoid sharing when I set up this blog, as I am no expert of politics or economics. Some of the things proposed may not even work in the real world. But they seem to work for Cities Skylines. So, this was just a bit of indulgence on my part, a bit of fun. I hope you enjoyed it. If you would like to see more Cities Skylines, comment below. I have an idea on a how to series for Youtube as I have found there to be abundant Cities Skylines videos, but most of them are impractical or unhelpful for people playing the game according to its design. And by that I mean, the videos in question are more about design and thus have infinite money unlocked and all buildings. Not helpful if you want to know how to build a city with finite resources. So, comment below if you want to see more on Cities Skylines, and I will try to accommodate as best as my system will allow. Really enjoyed that and yes. 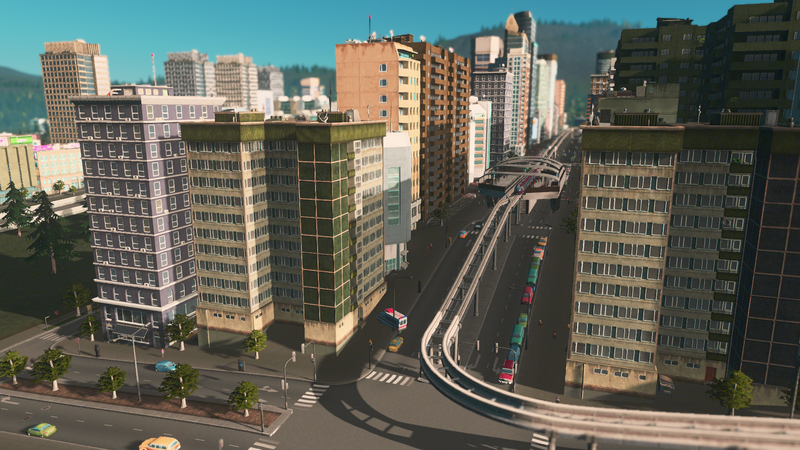 More cities skylines! I got a new microphone and tested. Sound quality is excellent. However my pc seems to struggle running the game and screen capture at the same time. Seems to stabilise after a little while.